I am chocoholics. No doubt. 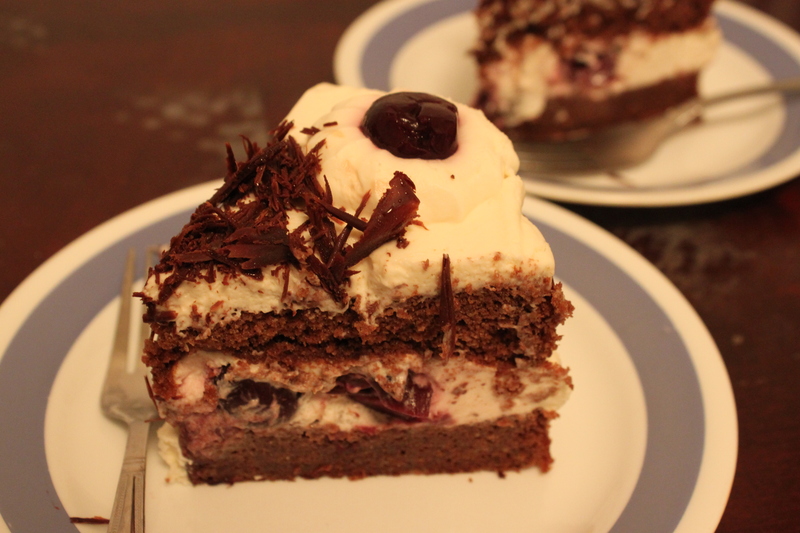 Black Forest Cake originates from Germany with the buttercream frosting. This recipe version comes from the Cake Bible with a little adaption to pamper my chocolate favorite. All you need to care is to make a perfect Chocolate Genoise. Be careful when you assemble this cake. Its genoise is pretty light so that you need to rest it until it’s cool down totally before frosting. – 3/4 cup cake flour (sifted). – Add the chocolate into 1 cup of beaten egg and mix until they incorporate. Add this chocolate mixture back into the remaining beaten egg and slowly fold the two mixture until they incorporate. – Sift the cake flour 1/2 cup a time and fold into the egg mixture. Pour the mixture into the 7 inch round pan. – Bake at 350 F for 30 -40 minutes until the cake is totally set. – Let it cool down. Make the syrup by microwave the cherry juice for 1 minutes and add the sugar. Stir until the sugar dissolves and add the liqueur. – Right before assembling the cake, brush the syrup over the cake generously. – Pour half a cup of heavy cream to gelatin liquid and stir to mix well. Add the remaining heavy cream into the gelatin mixture and beat with sugar and vanilla extract until the heavy cream form the soaf peak. Don’t overbeat it or the heavy cream will be dry and could be separated into buttermilk and butter. 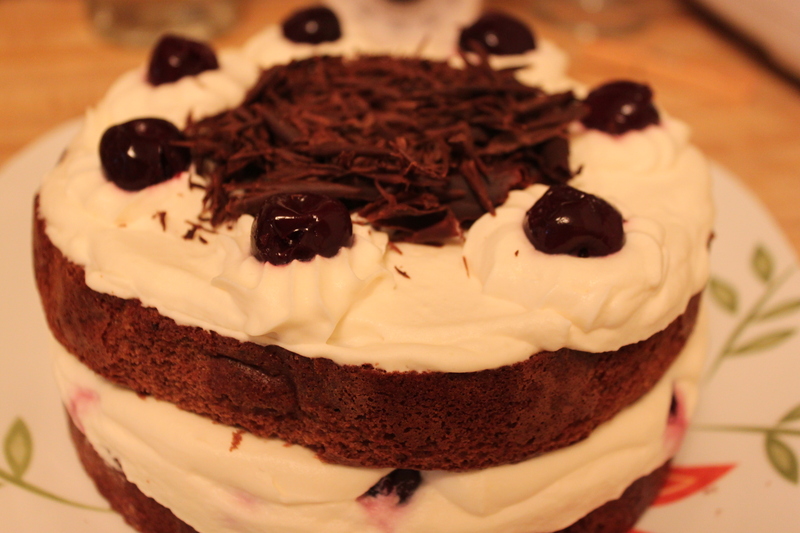 – Add half of beaten heavy cream onto 1 syrup soaked cake layer. Add all the cherries except 12 cherries to decorate later. Push the cherries to the cream firmly. – Put another cake layer onto the cream. Add the remaining cream, except half a cup to pipe the flower cream for decking. – Pipe 12 cream flowers and place 12 cherries on those. This entry was posted in cake, dessert and tagged cake, chocolate, dessert. Bookmark the permalink.